Are you ever frustrated or hesitant when you talk to prospective customers because you can’t readily explain why they should come to you rather than go to your competitors? Sure, you might have your 30-second elevator speech, but then they ask you that dreaded question, So what makes you different? Then, all those self-doubts creep in, and you just aren’t sure what to say. Differentiation can boost confidence–yours in yourself and that prospective customer’s confidence in you! Dif-fer-en-ti-ate v. tr. To perceive or show the difference in or between; discriminate. 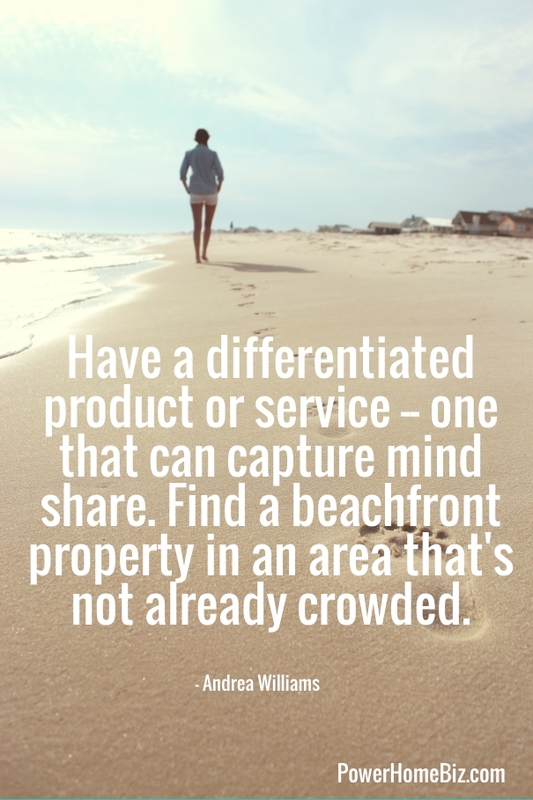 As you are building your business, you can use differentiation to attract more customers. Once you have momentum, differentiation allows you to charge a higher price because you are delivering more value to your customers. Make a point to evaluate and adjust your differentiation methods at least annually. More value – offer more products or services for the same price. Freebies – accessories, companion products, free upgrades, and coupons for future purchases. Free shipping, etc. – convenience sells, especially when it is free! Location – take advantage your closeness to prospective customers. Customer specialization – be very specific about what characteristics your customers will have for example, racing bicycle enthusiasts or companies with a spiritual conscience. Customer relationships – know customers really well, form partnerships with them, and get them to speak for you! Affinity relationships – associate your product/service with a well-known person or organization. One-stop shopping – offer everything your target market needs, in your area of expertise. Wide selection (within your niche) although this one may seem to be the opposite of focus – the key is to be very specific in one dimension and very broad in another. New/First – be the first one to offer something in your location/field. Features/Options – offer lots of choices, unusual combinations, or solve a problem for a customer in a way no one else does. Customization – as a Solo Entrepreneur, you may be able to more easily handle special orders than big, mass-market competitors. Deliver Fast – next day, or one-hour–make it faster than customers think possible. Unique channel – offer a service over the phone or Internet instead of in person or in their office rather than yours. Service-delight customers! – it may seem expensive to offer exceptional service–but it pays off in word-of-mouth advertising. Before/during/after-sales support – provide technical or other support to customers using your product. You might use joint ventures to provide that support–but customers will perceive it as being from you! Guarantee/warranty – offer 100% money-back, or free replacement parts. YOU – offer yourself, your unique blend of talents and skills, to attract customers. Make sure they get access to you, too! Know your customers, really, really well. Pick a blend of differentiation methods that, in the eyes of your customers, truly sets you apart. Talk about your differentiation in terms of customer benefits. Tell everyone about what differentiates you–often. Keep your differentiation fresh by listening for changing customer needs. Terri Zwierzynski is a coach to small business owners and Solo Entrepreneurs. She is also the CEI (Conductor of Extraordinary Ideas) at Solo-E.com. Terri is an MBA honors graduate from UNC-Chapel Hill. Terri has been coaching for over 10 years in a variety of settings, including 6 years as a senior-level coach and consultant for a Fortune 500 company.